Joey, the chocolate Labrador, loves to run and run. Living in the neighborhood of the Boston Marathon, he runs as many as twelve miles a day, early in the morning, with his dad. But after they return home from a run, Joey still wants more, much more. Keenly observant, he allows no opportunity to explore the world pass him by. But will his insatiable sense of discovery lead him to gratification? Or to danger? A decision Joey makes early one morning forever changes his life and the lives of his mom and dad, his running partner. Dogs Don't Look Both Ways is a true story with a unique voice and a lot of adventure. 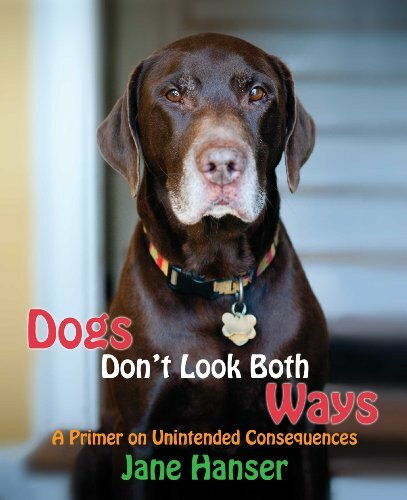 Readers love Dogs Don't Look Both Ways for its colorful and heartfelt story-telling, but the canine narrator never lets go of the book's main messages about discovery and freedom, rules and boundaries, communication and caring for a dog, and, of course, our dependence on the kindness of others. 4/2/2018 sarah evans said: I read your article(Dogs Don't Look Both Ways: A Primer on Unintended Consequences) $1 web Hosting, your article is really good. I shared your article with my friend. I hope people really like your article and give good feedback. 6/5/2017 1len 1len said: replica yeezy boost 350 Incredible review, I am a major adherent to remarking on websites to illuminate the web journal scholars realize that they've added something beneficial to the internet!